With my sassy '80s side pony, coordinating shirt, shoes and lips, and not-so-subtle nautical motif (you can't even see my anchor earrings), I felt almost obnoxious in this outfit. But, hey, sometimes when the mood strikes, you gotta go with it, and this is exactly what I felt like wearing yesterday. I really like the shoes. I eschewed red shoes for a long time because they seemed a little obvious, but now I want a pair. You look FANTSATIC here. Loving the colours. I really love how vibrant the colors in this outfit are! Your side pony tail is super cute too. Love those shoes pretty fiercely. Nothing beats a good red shoe. That last photo is adorable! 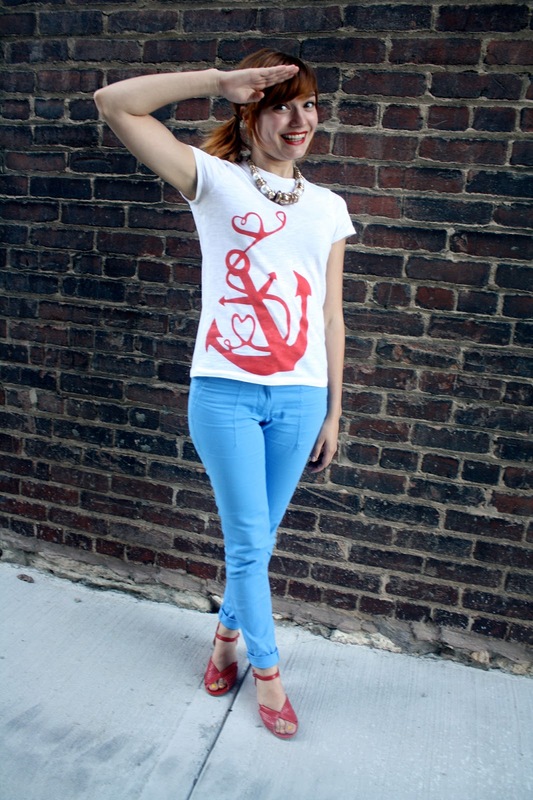 I love anything with a nautical feel; that tee is perfect for summer!